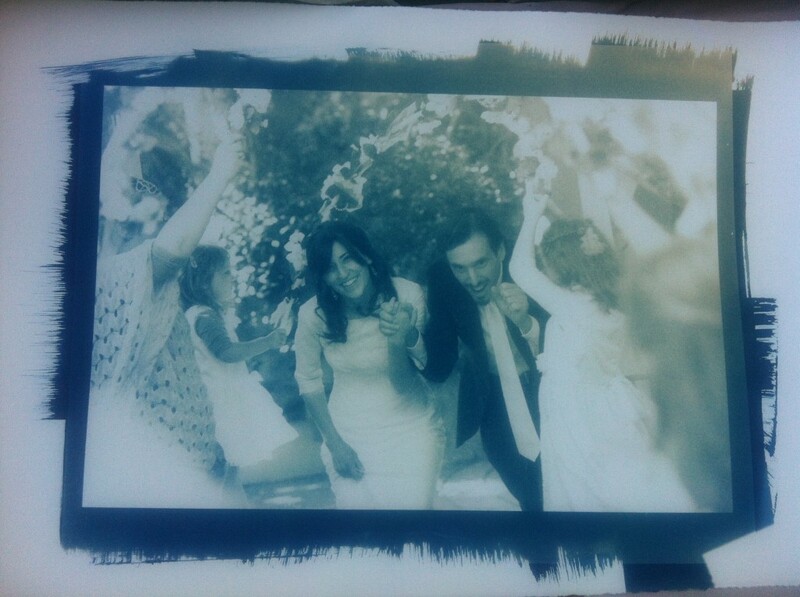 Cyanotypes are one of the easiest alt process prints to make. Bought as a kit from just about anywhere, you get two bottles: part “A” and part “B”, which you mix in equal amounts before applying to paper. Dry; expose to light; wash in water. Kids play. 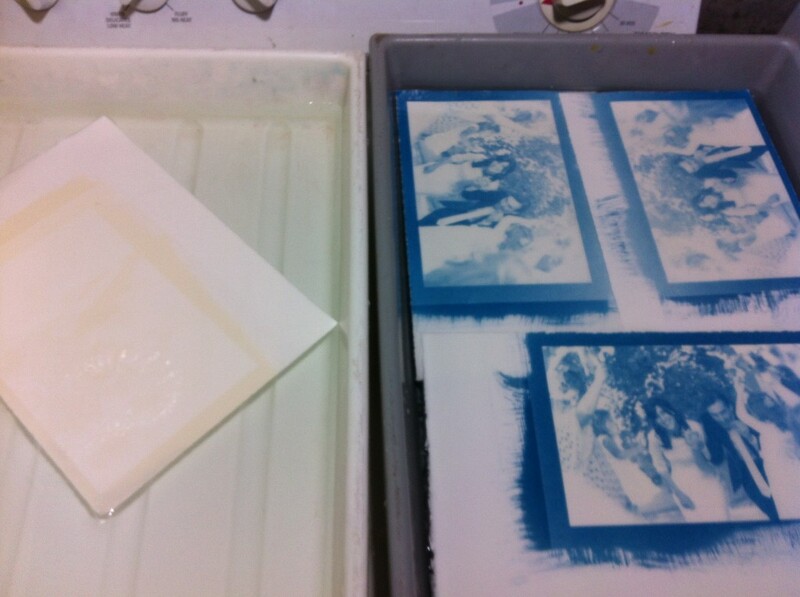 I like to use cyanotype as the base layer for my gum prints. The cyan is bold, provides a great foundation for registration of the other negatives, easy, and lays down on the paper before I size it. But that doesn’t have to be the be-all and end-all of cyanotypes. With a little extra effort you can wind up with yellow, brown, black, purple, and probably other colors as well. As a demonstration, I treated a half-sheet of Rives BFK paper with cyanotype; dried it, and then exposed the sheet for 15 minutes with four identical negatives. 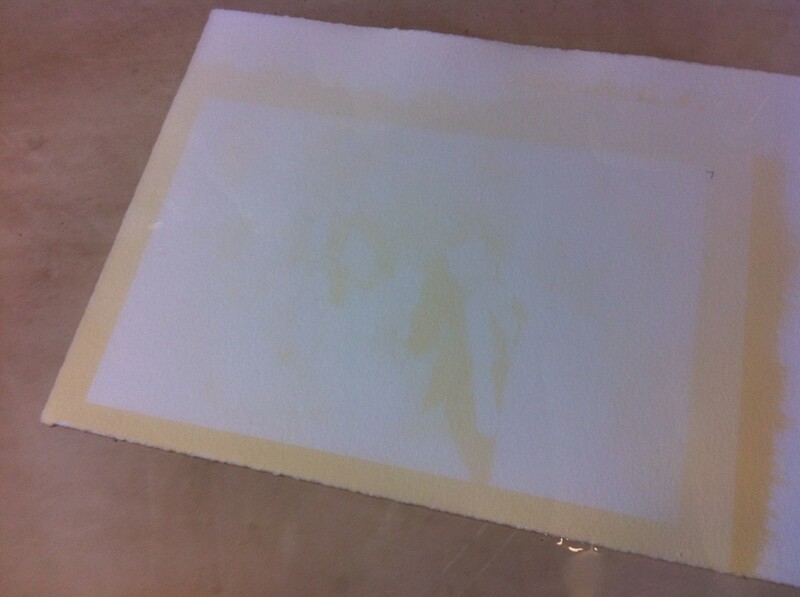 After the print was exposed I ripped the sheet in to four quarters and developed each separately. Note that these colors aren’t exactly true to the prints. I usually take great pains to get the white balance as correct as possible on the images I post, but I haven’t done that with these. Don’t treat the colors here as canon; they’re just ballpark. Obviously, the three toned prints are a bit light on detail. If you’re going to bleach and tone you should overexpose the cyanotype by at least a stop. I didn’t do that with this set of test prints in order to present a head-to-head comparison of how toning affects the final print. 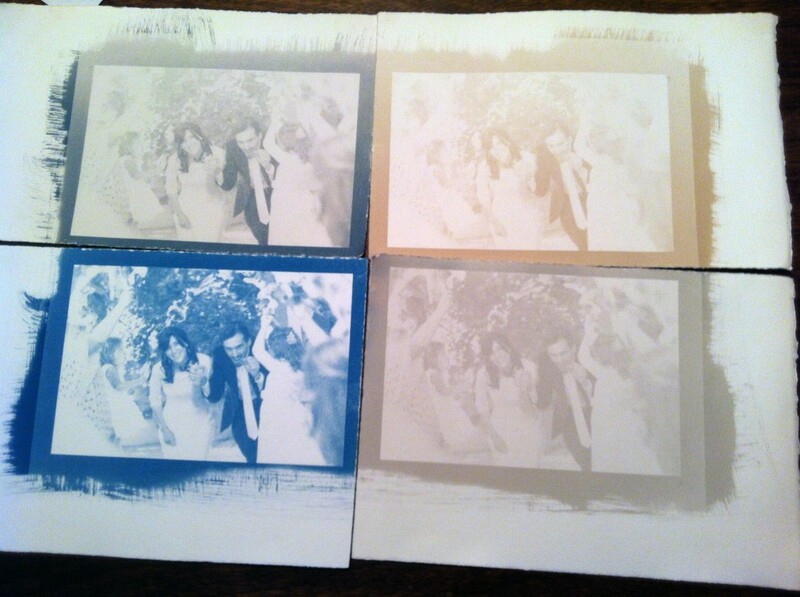 The lower left print is straight cyanotype: after the vinegar-water, it soaked in plain tap water. The print to its right (the lower-right corner) was bleached in a 5% solution of trisodium phosphate (TSP) for about 10 seconds. The bleaching happens very quickly; the print goes straight to yellow. Then I soaked it in coffee (8 tablespoons of Folgers Instant – which I also use for caffenol development of film – mixed in one liter of water) for about 10 seconds; washed it carefully and quickly to keep the paper from staining too badly; back in the coffee for another 10-second tone, and finally washed in water before hanging dry. The upper-left print is the same procedure as well, bleaching using a 3-second dip in a solution of 50ml household cleaning ammonia and 950ml of water, and then moving on to coffee, wash, and dry. After bleaching and before toning with coffee, the TSP and sodium carbonate bleach turn the prints straight yellow. The ammonia would do the same if you left the print in the ammonia longer than a few seconds, but ammonia also does something pretty fantastic on the way, if you can control it: you can turn the print dark purple before it bleaches out. I wanted to stop it at purple but overshot, and wound up using the coffee to bring a bit of detail back in to the print.